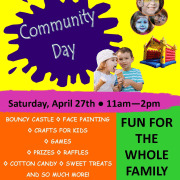 Volunteers needed to help at the Anne Arundel County Food Bank (AACFB) Community Day Event on Saturday April 27th from 9am until 3pm. This is a one-day event and will be open from 11am until 2pm. Volunteers will help set up, staff booths, collect tickets, and assist attendees with games, prizes, etc and help break down after the event ends. This will be a family event in a carnival-like setting at the AACFB. Must be friendly, patient, and outgoing.